Pace is pleased to present the gallery's first solo exhibition of works by Random International. An opening reception will be held at 537 West 24th Street on Thursday, September 22, 2016, from 6 to 8 p.m.
Random International is a collaborative studio for experimental practice within contemporary art. Founded in 2005 by Hannes Koch and Florian Ortkrass, the studio now includes a larger team in London and Berlin. Questioning aspects of identity and autonomy in the post-digital age, Random International’s work invites active participation. Their work Rain Room—a large-scale environment of continual, responsive rainfall—has been exhibited at Los Angeles County Museum of Art (2015); Yuz Museum, Shanghai (2015); Museum of Modern Art, New York (2013); and London's Barbican (2012). The studio’s work formed part of the Lichtsicht Biennale (2015), Ruhrtriennale (2013), and Moscow Biennale of Contemporary Art (2011). 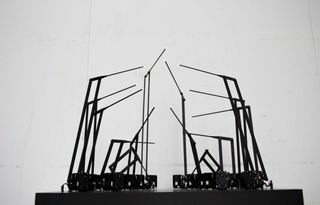 Solo presentations of their work have been exhibited at Lunds konsthall, Sweden (2014) and Carpenters Workshop Gallery, Paris (2012). Their work is in the collections of MoMA, LACMA and Victoria & Albert Museum, where their Swarm Study III is on long-term display.